“To Heck With Your Standards” Set | That Was an Accident! Thoughts: Sometimes, when I look at sets like the Talonguard Set, I think that some poor designer at Blizzard must’ve started off with a solid, comprehensive idea (oogly as it was), but then he or she got the stomach flu and it all went to sheeyit. The shoulders (to say nothing of the helm) don’t match unless you cross your eyes and vomit at the same time. Buuuuut if I take those same shoulders and use them with pieces that actually share the color scheme (whoa, revolutionary thought there! ), it doesn’t turn out so bad. Gotta say, that beehive just rocks the casbah. As long as she’s got hair like that, she’ll never wear a helm. I have Sul’thraze the Lasher because I had Jang’thraze the Protector in my bank and asked Cal what the heck I should do with it, considering I had no plans to use 1 handed swords. Cal immediately suggested I get the other and create Sul’thraze, and by “suggested” I mean he more or less motored me around Zul’Farrak and killed everything for me, because that was way faster. Other than the sword, everything was an AH buy. 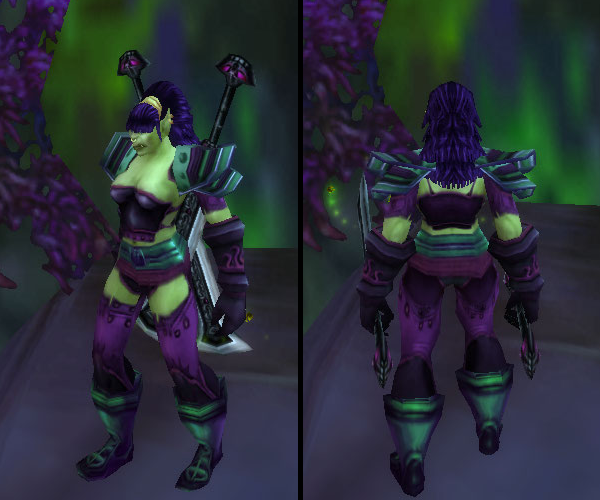 This entry was posted in For the Horde, Baby!, Orcs, Plate, Transmog, Ugbeis, World of Warcraft and tagged orcs, revenant chestplate, revenant gauntlets, revenant leggings, sul'thraze the lasher, symbolic belt, symbolic greaves, talonguard epaulets, transmogging, ugbeis, warrior, world of warcraft on September 18, 2012 by Prinnie Powah. Orcs look good in everything! Hell yes they do. I could give her a barrel and she’d rock that barrel. Pingback: “Fancypants” Set, or, “The Quick Templar” Set | That Was an Accident!